PicEdit is a free, small and fast image editor which gives you basic editing functions in a wonderfully simple layout. With this useful image editing, you can apply color correction, hue and saturation, draw shapes, add text and save the resulting image in a variety of different formats. The design of the main application layout resembles something you might find in Windows like the MS Office Ribbon. In that sense, it is familiar and easy-to-use. 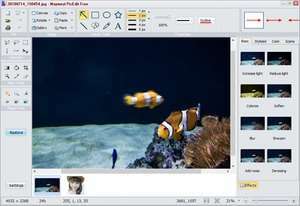 For security reasons, you should also check out the PicEdit download at LO4D.com which includes virus and malware tests. Additional screenshots of this application download may be available, too.